Italian novelist and play-write Luigi Pirandello published his first novel Il fu Mattia Pascal in 1904. 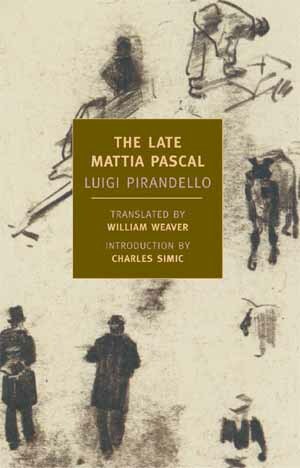 It has received a couple of translations into English, named The Late Mattia Pascal, first in 1923 and subsequently by William Weaver in 1964, whose translation is used in the New York Review of Books, reviewed here. Apparently, with the exception of this particular novel, much of his work is largely forgotten in English. I’m not sure if this is a shame or not. Either way, this is a witty attempt to examine the search for identity and loneliness. Mattia Pascal, who in his youth was looking forward to a comfortable life due to the wealth of his late father, finds his adulthood a disappointment. His inheritance destroyed by the corruption of the man charged with looking after the family affairs, Pascal finds himself working in a job for which he has no love and trapped in a miserable marriage. Arguments with his wife and mother-in-law encourage him to run off to Monte Carlo. Whilst there he has a string of good luck in the casinos, which leaves him – if not quite wealthy – of independent means. However, this good fortune is tempered slightly when he learns that the people of his home town believe him to be dead, after finding a body at the local mill. Quickly, though, he realises that there is an opportunity within this. It wasn’t as though the life he led was an enviable one, so he takes the decision to accept his death and start a new life for himself. He decides that he should kill Mattia Pascal entirely. This being the case, he realises that he should not only alter his appearance as best he can and change his name (on overhearing two men debating on the train he translates the name Hadrian into the Italian Adriano and take ‘Meis’ as a surname from a name shouted by one of the men to prove a point), but he should also create a whole new life story for this new man. Initially, he revels in the opportunity that his new found freedom from his past affords; he is no longer required to contribute to society, he is able to please nobody but himself. Of course, he is fortunate that he, despite little experience as a gambler, was able to come into sufficient funds to support him before this change in his life; I’m happy to forgive the author that, though. One might argue that it’s the least unlikely thing about the novel! However, as he settles into his new life, after taking the opportunity to tour famous sites in Italy, he begins to discover that his lack of identity whilst, in some sense, liberating, has also left him a lonely and disconnected man. For practical reasons, his lack of identity prevents him from taking any part in civil society. He is unable to take a job or marry, for example. Granted, this frees him from the need to pay taxation and his experience with marriage to this point had been less than happy. But Pascal starts to realise that loneliness makes him as unhappy as he had been before. He finds that on top of this, he is unable to make close friendships for fear that he may inadvertently reveal the truth of his life. Mattia Pascal, therefore, decides that he should reclaim his past by killing Adriano Meis and returning to his home. Unfortunately, he finds that people have moved on without him. His wife has remarried and to a man that neither of them had had any respect for when Pascal had been alive. The story itself is, some might say, slightly far-fetched; it may seem unlikely that so little investigation would have been made into the identity of the man whose body they found. Pascal himself does consider that it’s possible that people, especially his wife and mother-in-law had been keen also, to take the opportunity to be rid of Pascal. This, slightly macabre tale, is a vehicle for Pirandello’s thematic concerns. Mattia Pascal discovers that his freedom is illusory. As he loses his identity so he loses his ability to control his own destiny. He is as effectively – if not more so – imprisoned as he had been before. He, in giving himself the new identity, is attempting to free himself from the past; he quickly discovers that for people, reality only exists in their past and their relationships with other people. He is, in cutting himself off from both, effectively destroying his own world. If he believed that social conventions were unreal constructions, illusory, this certainly changed by the end of the novel. This is aspect of the novel is extremely well handled by Pirandello and this is why I would reject any complaints about the implausibility of the story. What worked slightly less well is when he puts words into the mouths of the characters. Didactic novels are seldom fun and, whilst because a character holds an opinion it doesn’t mean that the author does, there are a couple of instances where I did feel that perhaps the author was putting words into characters mouths. The introduction gives a little insight to Pirandello’s life and beliefs; it seems that he was suspicious of democracy, this is why the passage above grated a little. I’m not suggesting that characters in novels shouldn’t have philosophical discussions, and as I’ve indicated, I realise that it’s possible for characters to do and say things with which the author may not agree (though I’m not sure that’s the case here). Hey – it’s fiction. It’s just in this instance, I felt that elements like this were not quite in keeping with the delicate touch displayed in the examination of his main theme. These minor complaints aside, I recommend this novel. Pirandello has succeeded in creating a work which is of a reasonable philosophical heft, whilst retaining a streak of (extremely black) humour, which keeps the work accessible. Much of the humour in the novel is derived from the slightly sardonic tone taken by Mattia Pascal as he narrates the story of his life. As he has come to realise that his life is destined to become a series of setbacks and crushing disappointments, it is as though he resolves not to take anything seriously again. I imagine that we have William Weaver to thank for the quality of the translation, being as this is transmitted well to the reader in English. This entry was posted in Review and tagged luigi pirandello, novel. Bookmark the permalink.